Knowing storytelling techniques is not a "fluffy" or soft skill for your business. Just as your accountant needs to have strong skills in numbers and laws, so must all your staff and volunteers learn storytelling, both creating and listening. As good accounting can be a barometer about your company so does storytelling give you a picture of your organization's health. Like the ledger, business storytelling reveals truth about your organization. No matter if your company has just a single entrepreneur or a payroll of thousands, pay attention to these revelations. 1. Storytelling reveals what your customers really think. Gathering customer stories tells you what is truly happening. No matter what organizational myth you might have, the real truth comes from your customers. There is a reason the "Emperor's New Clothes" is such a popular story for so many generations. Are you going to be caught naked someday because you did not truly listen to your client's real stories? 2. Storytelling reveals who is really paying attention. Your company should make it a point to conduct regular sessions of story gathering from employees and management. Processes like my "Intentionality"(tm) activity help anyone in any company create stories about everyday experiences. Like a Board that cannot tell you about the company ledger, be very afraid of any upper management that never has new stories of the company. Stories of how the powerful are deposed are very common in world folktales. Is your CEO paying attention- even if the CEO and the janitor are the same person in your small business? 3. Storytelling reveals your organization's ability to adapt to change. For survival, your ledger needs to show some reserve funds for your metaphorical "rainy day." So, too, stories of change show how your company has the readiness and acceptance of the inevitable shifts in the market. Are you prepared for everything to change tomorrow? Are you stuck in the same old ways? Can you make a list, right now, of the stories that show how your nonprofit or business has adapted to change? You do not have past stories of change management and adaptability in your company? You are in for a rough future. Corporate stories and skills in business storytelling, yes even storytelling for financial advisors, are as valuable to your group as good accounting. Are you giving storytelling the attention it deserves? Sometimes there are surprise moments when some rather public storytelling skills are demonstrated very well. It is common to see public figures fail at storytelling. However, at the Michael Jackson Memorial service, entrepreneur and former professional basketball player Earvin "Magic" Johnson demonstrated a command of and elegance to his story. Although many speakers spoke at "MJ's" funeral, Magic's few moments stand out. Here are 4 things that anyone who wants to use storytelling can learn from Magic's story. 1. His story was brief. I am sure that Mr. Johnson may have had more to say, but he cut through the extraneous details and went directly to his point, taking the audience with him as he experienced the wonder he felt as Michael Jackson ate KFC (Kentucky Fried Chicken) with him one night many years ago. Ironic as it may sound, the purpose of being a storyteller is not to talk words but rather to communicate ideas. 2. It was a story told in the "voice of the people." I have watched and commented on many public speakers, especially politicians, who try to speak "to the people." In the Jackson memorial, Magic Johnson used an important storytelling technique: talk so people understand. His words were simple. His illustrations were accessible to all as he talked about family gatherings, dinners, playing games with family, celebrity-meeting nerves and eventually, something as simple as a fast-food icon: a bucket of chicken. As a pro-basketball star, Magic could have easily made sports references. However, no sports reference would speak to such a wide range of listeners as his family references did. Choosing to speak to your audience so they understand rather than using self-serving references is a sign of a mature and effective speaker. 3. In his story, he laughed at himself. Magic's story was not to tell people how wonderful he was but rather to share how wonderful he thought Michael Jackson was. A good storyteller can reflect the focus on the story and the subject of the story. 4. His story was actually a story. It contained a beginning, a middle and an end. Magic did not tell an anecdote: "I once sat on Michael Jackson's carpet and ate KFC with him. Wasn't that cool?" Rather, he placed his story in the context of a developing relationship with the family and the invitation to dinner. Without being sappy or manipulative, he shared his own feelings about the invite and his surprise to discover his idol ate "real food" like everyone else. His story supported this expression of hope for the future. At the end of his comments, when he referred to Michael's children having family support, you knew his point of reference to make such a statement. Although in the past Magic has been critiqued for his speaking style, his presentation at the MJ funeral was a good example for any speaker striving to improve their storytelling skills for business or personal use. Sean Buvala is a public speaking coach who specializes in helping you tell your core story. 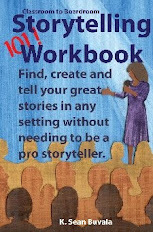 For free Email lessons, please see www.storytelling101.com .